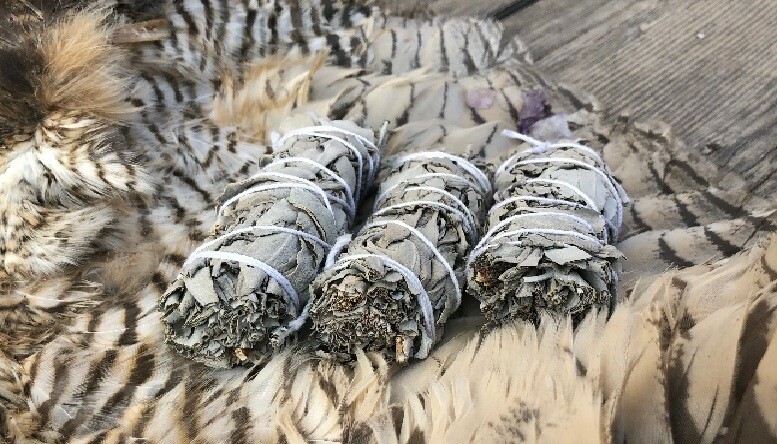 Introducing our selection of White Sage, a sacred, cleansing, purifying, spiritual tool for home, ceremonies and more. Our White Sage is blessed within the energies of the Unified Field of Pure Consciousness. Native Americans have passed on this tradition for generations. The use Sacred Sage, which represents the Divine Feminine energies, helps ward off evils spirits, negative energies and used in ceremonies to seek blessings of protection, healing, prosperity and the banishment of spirits. We recommend the use of white sage for all your cleaning needs and the scent is itself is amazing. Consider our selection of White Sage, which represents the Divine Feminine energies, for additional cleansing and clearing. Also our Palo Santo, which represents the Divine Masculine or Gaia's Ceremonial Cleansing Kit. A powerful combination for any home. We are a 501c3 Non Profit Charity organization dedicated to raising the consciousness of the Planet into Unity Consciousness. All proceeds go to our special projects in Mother Earth's Healing. Disclaimer: We are not medical professionals and cannot offer any medical opinions or diagnoses, nor do we provide any FDA approved advice or products. However, we do provide our personal experiences of healing and success using colloidal silver and other alternative medicines, as well as the guidance of its amazing healing properties from Mother of All Creation. We suggest that the use of colloidal for healing purposes be used in conjunction with all of our spiritual techniques and tools. We do not guarantee or make any promises of its effectiveness in healing or curing any diseases or illnesses, as every being must take responsibility for the healing of their personal energetics. We do guarantee that each bottle of colloidal has been made in pure consciousness, with loving intention, and infused with Kryolite crystals and moon bathed for purity. We hope you enjoy our product and feel the love we have poured into it.